Thank you for your interest in the MOSS Sea Kayaking trip to Glacier Bay, Alaska. Glacier Bay is a completely amazing place! I have been in love with it for nearly twenty years. MOSS is an outdoor community that desires to connect people to the creator through wilderness experiences and self guided periods of solitude. The backcountry of Alaska is indeed is a very challenging place to be and we will be there for nearly a week. It is extremely important that precautions are taken before and during the trip for everyone’s safety. Proper handling of food and other items are vital for protection, both black and brown bears are residents of Glacier Bay. Proper attention to the extreme tides of Glacier Bay are also a must to prevent the loss of kayaks and thus, transportation. Glacier Bay’s weather can include long periods of rain which must be understood. Many other concerns need to be addressed before hand which can be discussed as we prepare. Group size will depend on kayak availability but cannot be larger than twelve based on National Park Service regulations. At this point other double kayaks are unavailable. There are several single kayaks but be aware that Glacier Bay Sea Kayaks requires that paddlers must be experienced at sea kayaking and able to do self-rescues. Don’t let this stop you if you are still interested, you have several months to prepare yourself and possibly take a class. There is also a possibility that other double kayaks become available. Please contact me if you would like to discuss more. With all of that said, I am very excited for the interest and looking forward to a fantastic week in Glacier Bay! Let’s continue this conversation before anyone makes a complete commitment and buys airline tickets. Please feel free to call anytime, I always love to talk Alaska! • -Arrival into Glacier Bay Lodge at Bartlett Cove from Gustavus, AK (transportation via TLC Taxi (907-697-2239) $15 per person + tip) *possibility of free transport with lodge bus + tip but will not know until we are there. • Gear consolidation and preparation for extended backcountry trip. o Activities include small town with fun games like egg toss, slow bike race and toped off with the greased pole contest over the Salmon River. • Evening meal and Withdrawal time. • 5pm meet GBSK to receive our kayaks. o Single Kayaks ($45 per day + tax) Must be experienced sea kayakers and know re-entry skills in case of capsize. GBSK will not issue kayaks if this requirement is not met. • Last minute gear prep. • Group time on the deck of Glacier Bay Lodge and/or Warming Hut. • Early morning wake up and pack up. o $230 for round trip transportation to backcountry drop-off which includes day glacier and wildlife tour with a National Park Service guide and lunch. • 730 am wake up. • Day paddle into Johns Hopkins Inlet- distance weather and group dependent. Potential of 20 miles round trip but worth every mile. • Transportation into Gustavus (transportation via TLC Taxi (907-697-2239) $15 per person + tip) *possibility of free transport with lodge bus + tip but will not know until we are there. • Lunch and Withdrawal time close out with possible discussion. Every MOSS event includes a time of Withdrawal, where we take the opportunity to disconnect from the distractions of life and re-engage with the Creator. Solitude during Moss trips are experienced through a self-lead time of reflection in the example of Jesus who, "Often withdrew to the wilderness to pray." We will temporarily part company from the rest of our group and find a quiet place to consider the provided readings and prayers. It is recommended that participants bring a journal and pen to write what comes to mind as they experience God through the discipline of solitude and silence in this natural setting. Once this period of time is complete there may be a short discussion for those who wish to participate. Out of respect to you, the provided readings are optional but would ask that everyone agree to observe the Withdrawal time even just for the benefits of rest. To all you Old Rag Hikers! Please thoroughly read the following information concerning our hike. Make sure this hike is for you! Its going to be tough, which also means its going to be awesome! Please contact Pete at mossoutdoors01@gmail.com or 304-283-4628 if you are interested in camping Friday and/or Saturday night. As with every MOSS event there will be a time of Withdrawal, where we take the opportunity to disconnect and re-engage with our Creator. This is done through a self-lead devotional time in the example of Jesus who, "Often withdrew to the wilderness to pray." We will part company from the rest of our group temporarily and find a quiet place to consider the provided readings and prayers. It is recommended that participants bring a journal and pen to write what comes to mind as they experience God through the discipline of solitude and silence in this natural setting. Once this period of time is complete there will be a short discussion for those who wish to participate before the hike is continued. Visitors hiking Old Rag must have a valid Shenandoah National Park entrance permit. You can purchase permits and yearly passes from Rangers when present, or via self-pay at the Old Rag Fee Station. 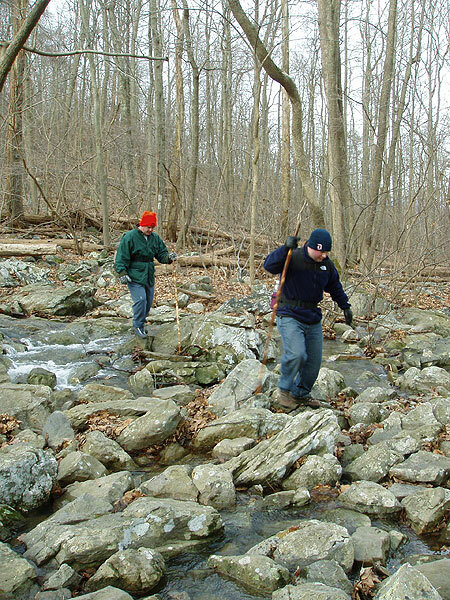 Hikers navigate a narrow passage. This Saturday April 9th from 8:30am–7pm, will be a work day for the Shannondale Springs Prayer and Nature Trail on the property directly behind the Shannondale Springs Chapel on Mission Road. 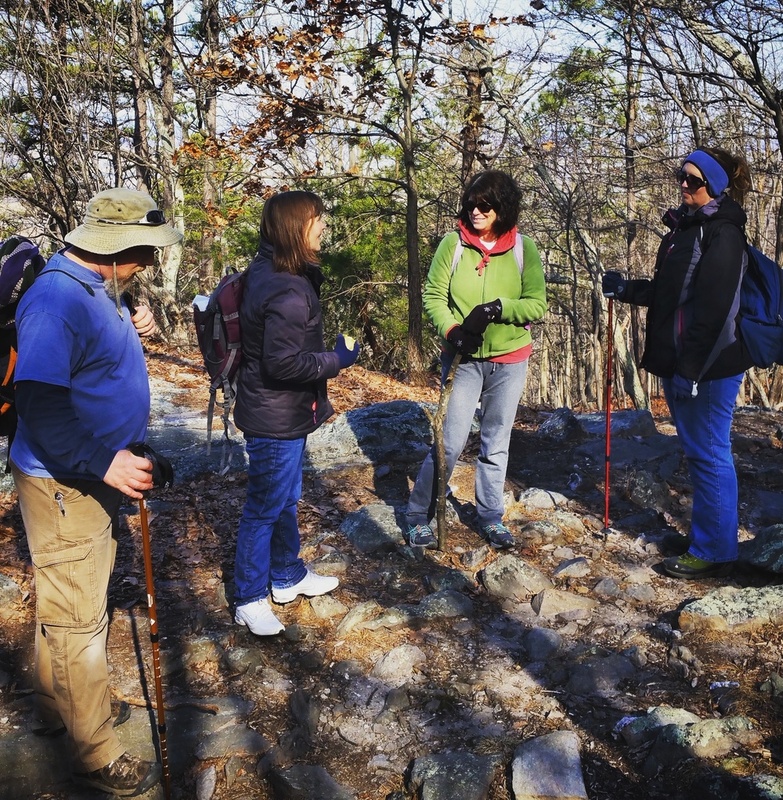 The trail is meant to be a place to deepen our faith to include stations designed with spiritual themes to stop, rest and pray – to commune with God in the outdoors. It is also meant to serve the community as a nature trail to walk and explore creation and benefit from what it has to offer. You are invited to join us this Saturday to continue this work. Come for however long as you are able. Please RSVP to let us know you are coming. Bring a rake, or a pick, or loppers and gloves, water, snacks. Lunch will be provided. Future work day will be April 30th from 8:30am till 7pm. "This is one of the most popular sections of the Appalachian Trail in Maryland. 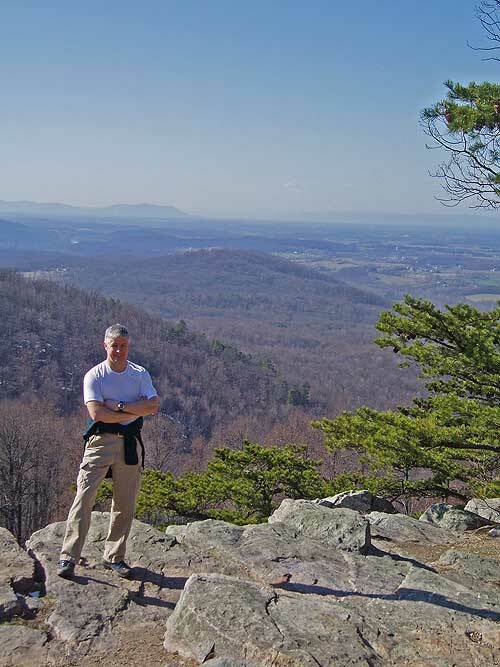 This 8.4 mile section of the AT features Annapolis Rock, probably one of the most visited spots along the AT in Maryland, with its spectacular westward views. 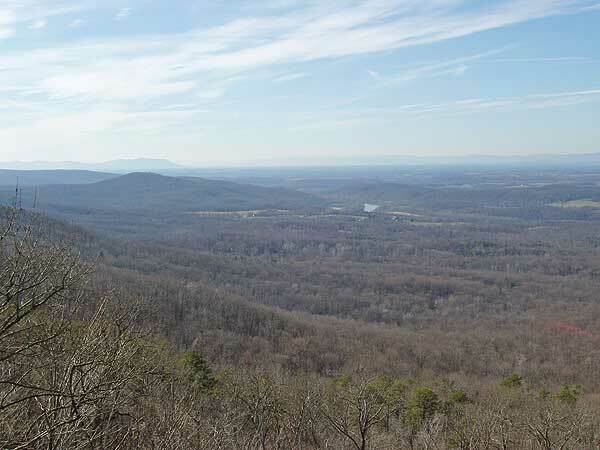 This section also features the fine views from Black Rock Cliffs as well as the Pine Knob Shelter." If you are coming from the Charles Town area meet at the Food Lion parking lot at 8:15am to car pool. This will be a full day hike so bring plenty of food and water. Hike start time will be 9am with an approximate end time of 4:30pm. As with every MOSS event there will be a time of Withdrawal, where we take the opportunity to disconnect and re-engage with our Creator. This is done through a self-lead devotional time in the example of Jesus who, "Often withdrew to the wilderness to pray." We will part company from the rest of our group temporarily and find a quiet place to consider the provided readings and prayers. It is recommended that participants bring a journal and pen to write what comes to mind as they experience God through the discipline of solitude and silence in this natural setting. Once this period of time is complete there may be a short discussion for those who wish to participate before the hike is continued. "This section begins where the AT goes under the US 40 overpass as the trail briefly follows I-70. Parking for this popular section is off US 40 and a blue blazed side trail takes hikers from the parking area to the AT just south of where this section starts. There is parking for about fifty cars and the GPS coordinates are N39 32.130 W77 36.223 for those who have a GPS devise in their vehicle. In about four hundred feet the trail turns right, leaves the busy expressway and begins to ascend. At 0.4 miles the trail bears right as the blue blazed side trail on the left heads 0.1 miles to the Pine Knob Shelter. This shelter was built in 1939 and sleeps five. There is a privy nearby and water is from a spring next to the shelter. At 0.8 miles the trail travels to the west of the summit of Pine Knob. At 2.1 miles a blue blazed trail on the left heads 0.25 miles to Annapolis Rocks, an overhanging cliff with spectacular views to the west. There are several primitive campsites in the area. There are also a couple of privies at this popular destination. At 3.1 miles several unmarked trails on the left lead about 100 feet to Black Rock Cliffs. The views from Black Rock Cliffs are probably better than Annapolis Rocks. If you plan a day hike to Annapolis Rocks, hike the extra mile to check out the view from Black Rock Cliffs. At 3.7 miles pass by the Pogo Memorial Campsite, just east of the trail. At 4.3 miles veer left at fork. The road on right leads 0.9 miles to Loy Wolfe Road. At 5.4 miles the trail becomes extremely rocky as the AT follows a sharp and eroded crest of South Mountain. At 6.1 miles there is a nice view eastward on your right. At 6.4 miles the trail follows an old road again. There was once an old sawmill in this area when the area was logged in the 1930s. At 7.2 miles begin the first descent off the eastern slope of South Mountain. At 8.0 miles begin a steeper descent toward Maryland 17, reaching the road at 8.4 miles and the end of this section. You'll find some parking along the shoulder of MD 17 and more parking nearby." Info provided from the link below. Check out this site for more trail details and consider making a contribution for their service. Meet at the Food Lion parking lot in Charles Town at 8am to carpool or join us at the Snickers Gap AT parking area at the intersection of the west bound lane of Rt. 7 and VA679 at 8:30am. The view from Raven Rocks is one of the best in the area. Although the distance is only 5.5 miles with a vertical gain of 1,530ft, as you can see from the elevation profile, there are three strenuous ascents on this out and back hike. Raven Rocks is also a popular area with rock climbers, as it can be accessed by a road 0.4 miles from the east. Make sure to wear sturdy footwear, as the hike that remains entirely on the white blazed Appalachian Trail, is very rocky. Begin the hike by heading north on the white blazed Appalachian Trail, as it crosses over the first ridge, then making several steep switchback descents before reaching a small run in 0.8 miles. 100 yards past the run cross over an unblazed trail and remain on the Appalachian Trail. During spring and fall, the Raven Rocks 100ft wall is a favorite spot with local rock climbers. To return retrace your route 2.7 miles back to the parking area at VA679 and Rt7. Skip the mall rush-Hike Maryland Heights-Bring toys for one of the 85+ kids that are in an orphanage or teen shelter and 300 kids in a feeding program all in Juarez and Madera, Mexico. 10AM - 3PM. Meet at the back portion of the Caviler Heights Visitor Center parking lot. Entrance fees are $10 per car. We will collect toys and proceed to ride shuttle to lower town. See the description of this hike below. If you are unable to attend but would still like to donate please contact Pete. Children outside of the orphanage in Juarez, Mexico operated by Rescue Ministries of Mexico. Our Vision: To provide a safe home for children, youth, adults, and the elderly. Our Mission: To serve God and our community. Our Target: To strengthen the Institution of the Family. Our Objective: To provide food, shelter, clothing, education and basic medical assistance to people in need, and most of all to announce the good news of our Lord Jesus Christ. We appreciate the opportunity to present to you the work we do at Rescue Ministries of Mexico and at our sister organization Vino, Trigo y Aceite. 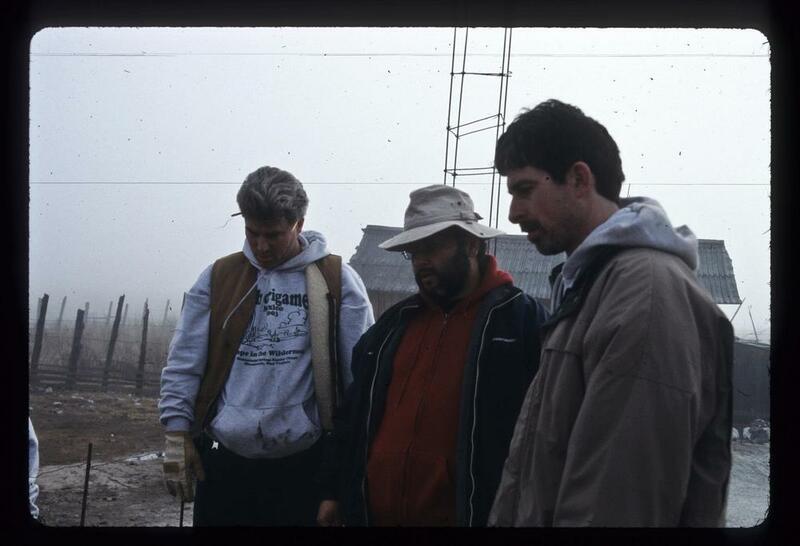 Rescue Ministries of Mexico is registered in the United States as a non-profit organization under chapter 501 C(3), whose sole purpose is to provide for the needs of the shelters & Ministries of Vino, Trigo y Aceite in Mexico. Vino, Trigo y Aceite is a Christian Organization founded in 1988 in Ciudad Juarez, Chihuahua, Mexico by our Pastor Guadalupe Varela de Páez. For over 20 years Vino, Trigo y Aceite has been registered as both a Civil and a Religious Association in Mex-ico, thus allowing us to work with children, adolescents, adults and seniors in key cit-ies of the State of Chihuahua such as: Ciudad Juarez, Chihuahua, Chih., Ciudad Madera, El Largo Maderal, La Mesa del Huracán, Chih. and in the city of Gomez Pala-cio in the State of Durango, México. Personal note: I have decided to organize this MOSS event on Black Friday to offer people an alternative to the mad rush on stores that feed into our materialism and instead ask participants to bring a toy to donate to an orphanage in Juarez, Mexico for Christmas. (Stop by the local Harper's Ferry shops on the way home! :)) Rescue Ministries of Mexico is an organization that I have spent a lot of time with and can speak personally of its leadership. Along with the pastor at Shannondale Springs Chapel, Porky Jones, we have visited most of the projects in which Rescue Ministries is involved, including orphanages, shelters, churches and food/clothes banks. Over the last 13 years, SSC has assisted in house and church building projects, repairs at the Juarez orphanage, school supply donations, pastoral support, and clothing drives. Probably the most beneficial part of our partnership is the strength of encouragement both groups have gleamed from this long term relationship. In early December, the Executive Director of Rescue Ministries of Mexico, Aurelio (Leo) Páez, will be coming to West Virginia to receive the toys and speak about his experiences with his organization and the adventurous life of mission work. More details will follow. Thank your for participation in this toy drive and hike. Stay tuned for similar events by "liking" our Facebook page. As with every MOSS event there will be a time of Withdrawal, where we take the opportunity to disconnect and re-engage with our Creator. This is done through a self-led time in the example of Jesus who, "Often withdrew to the wilderness to pray." We will part company from the rest of our group for a half hour and find a quiet place to consider a reading and prayers centered on our responsibilities for the poor. It is recommended that participants bring a journal and pen to write what comes to mind as they experience God through the discipline of solitude and silence in this natural setting. This will take place at the MD Heights overlook. "Difficult (steep and rocky in places), 4.5 miles round trip, 3 to 4 hours. Wayside exhibits. The Maryland Heights Trail offers hikers the opportunity to see many aspects of Harpers Ferry NHP on one walk: spectacular scenery, geology, Civil War and transportation history. From the Information Center in Lower Town turn right to merge with the Appalachian Trail at the dead end of Shenandoah Street. Cross the footbridge over the Potomac River. Turn left (upstream) on the C&O Canal Towpath. The trail stays on the towpath for 0.3 miles, and then crosses a footbridge over the canal bed to Harpers Ferry Road. Be careful! Watch for traffic. Directly across the road is the Maryland Heights trailhead. The first bend on this green-blazed trail offers a nice view of the Potomac. Go straight at the first intersection to a see the 1862 Naval Battery, then return to the green-blazed trail and turn right. At the next two intersections stay straight on the red-blazed Overlook Cliff Trail. About 0.3 miles turn right for a narrow, rocky descent 0.5 miles to the cliffs overlooking Harpers Ferry. Backtrack to the C&O Canal Towpath." WV Project CommuniTree Planting with the Cacapon Institue followed by a hike at Craftworks. Community members from Tabler Station Manor HOA are planting a mix of 16 trees in their neighborhood outside of Inwood. This is a perfect introduction to the Cacapon Institute and the important work that they do for the Eastern Panhandle of West Virginia and the entire Chesapeake Bay Watershed. Although the location of this tree planting may not seem like an inspirational location, MOSS folks know the importance of trees in all locations and the benefits that we reap by their presence in and around our lives. By participating in this first activity with Cacapon Institute, we will have the ability to assist in location selections for future MOSS tree plantings. This is the first official service event as MOSS and is extremely exciting. Future opportunities will include disaster relief, trail maintenance and trash cleanup projects. 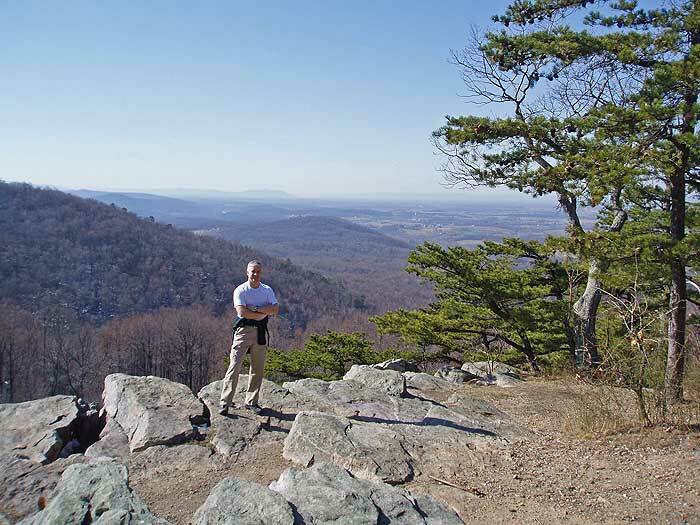 Following the tree planting, we will head towards Charles Town, WV for a hike at Craftworks on the Coolspring property. This will be a relatively easy hike that will give the MOSS group an introduction to what Craftworks is all about and potentially give us opportunities to work together in the future. Craftworks at Coolspring is a community supported nonprofit beautifully sited on 12 acres of environmentally sensitive land. Meandering Bullskin Run traverses our landscape which includes Cool Spring Marsh, a vital marl marsh containing 18 rare and very rare West Virginia plants. MOSS Fall Weekend-Biking/Hiking/Camping - Section Cycle Parts 3 and 4. Lets squeeze the last bit of warmer weather out before winter blows in! Join MOSS for an action packed weekend of camping, biking and hiking. Camp along the C&O Canal National Historical park and the Potomac River. Bike to Harper's Ferry and hike Maryland Heights. Wake up the next morning for another ride on the C&O. Columbus Day weekend has often been a marker for the end of summer type activities and is a good chance for some to take advantage of a three day weekend to get out for one more camping trip. This is Part 2 of the MOSS Section Cycle of the Chesapeake and Ohio Canal National Historical Park. We will begin at the large parking lot on Canal Road across the Potomac River from Shepherdstown, WV. (See the address and map. ) This trip will be a 17.2 mile round trip ride to Taylors Landing with a return ride back to Shepherdstown. As with every MOSS event there will be a time of Withdrawal, where we take the opportunity to disconnect and re-engage with our Creator. This is done through a self-lead devotional time in the example of Jesus who, "Often withdrew to the wilderness to pray." We will part company from the rest of our group temporarily and find a quiet place to consider the provided readings and prayers. It is recommended that participants bring a journal and pen to write what comes to mind as they experience God through the discipline of solitude and silence in this natural setting. Once this period of time is complete there will be a short discussion for those who wish to participate before the bike trip is continued. As this ongoing event proceeds, there will be opportunities to participate in cleanup projects that focus on trash removal from the Potomac River and the C&O Canal National Historical Park. What is MOSS all about?